The community of Mittelberg has some 5,000 residents and plays a significant role as a local economic centre of the Kleinwalsertal Valley. The community reaches throughout this valley and is well-known as a holiday destination. As a matter of fact, it is so popular that it ranks among the most heavily visited communities in all of Austria. The geographic location of Mittelberg is rather peculiar: Due to the high mountains surrounding the Kleinwalsertal, the only road to Mittelberg connects the community with Germany. There is no direct road connection with Austrian territory. Therefore, it is often called an Austrian "exclave", although this is only true in a functional sense. Nevertheless, Mittelberg was part of a tax union with Germany - this plays no big role anymore, since both Austria and Germany are members of the European Union. However, for a long time it meant that the Kleinwalsertal was supplied almost exclusively via Germany. There are various mountains surrounding the Kleinwalsertal, of which many are very popular for hiking: The Elfer and the Zwölfer, Mount Bärenkopf and Mount Widderstein. All of these are higher than 2,000 metres and part of a very impressive piece of Austrian landscape. The community of Mittelberg consists of three main hamlets or units: Mittelberg, Hirschegg and Riezlern. 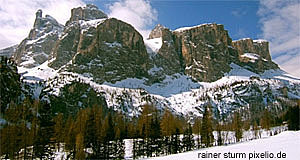 The valley was first populated by Walser people from today′s Switzerland in 1270. Ethnically, they were Alemannic. Therefore, the people in the Kleinwalsertal still speak a dialect that is very distinct and not directly related to the neighbouring area in German, the Allgäu. In terms of sightseeing, opportunities are rather limited - obviously, the three villages that jointly form Mittelberg are touristy, but not unattractive. Besides, as an international visitor, you will soon realize that the international appeal of Vorarlberg seems to be constrained to the skiing areas around Mount Arlberg. Here in Mittelberg you are likely to be the only "proper" foreigner among many Swiss, Austrian and German tourists that come to the Kleinwalsertal for the sake hiking. In the summer of 2006, a total of 717,000 night arrangements were sold in Mittelberg - of which only 9,500 went to foreigners. Attractions nearby - at least Austrian ones - require a car or a lot of time for the reasons described above. Similarly popular as the Kleinwalsertal, and also mostly with domestic and German tourists, is the Bregenzerwald Forest area. Try Schwarzenberg or Bezau for typical villages - or go to the capital of Vorarlberg, Bregenz. With a slightly longer drive you can get to the Tyrolean towns of Reutte or Landeck. Staying in Vorarlberg, Hohenems or the proper Alpine areas in the South-East of the province like the Montafon and Silvretta area make rewarding destinations.